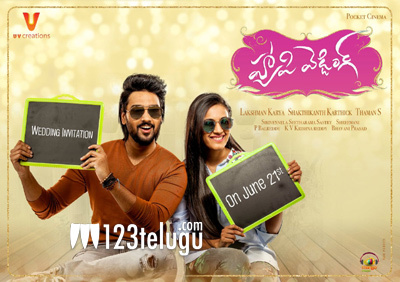 Young hero Sumanth Ashwin and Niharika Konidela’s upcoming romantic family entertainer, Happy Wedding, is into post-production these days. Debutant Lakshman Karya has directed the film. The latest update is that Happy Wedding’s ‘Wedding Invitation’ will be out on June 21. The invitation could be a teaser, but we will have to wait for a few more days for the surprise. Meanwhile, the makers are going to kick-start the promotions very soon. Happy Wedding is being produced by top production house UV Creations in association with Pocket Cinema banner. The film’s audio album has been composed by Fidaa fame Shaktikanth Karthick, while Thaman has been roped in to score the background music.